I urge you... no beg you.. to vote YES early and often as W. C. says, "MoveOn.org and the Kos kids drive the Democratic Congressional agenda. If we can get them focused on impeachment, it will distract them from passing bad laws." You can help whip the Soros-funded nuts into a psychotic self-destructive frenzy by�pouring a bit of�gasoline�on the flames as an amateur agent-provocateur. For my reasons for impeachment, I said "Bushitler is a Capitalist mass-murdering facist dictater." (Typos deliberate, for authenticity.) I will send a few more from my other rarely-used email addresses, with much stronger comments. Yes, it is beneath Maggie's Farm standards of decorum, probity, integrity, and respect for all humanoids�to suggest such a devilish act, but we just report. You decide for yourself. You vote here. Of course, if you�actually believe that Bush should be impeached for something, you'll be voting�on my side - for once! 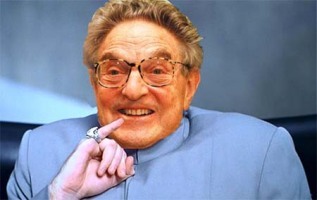 Photo: George Soros as Dr. Evil. Well, Sarko has won--big. That oughtta twist old Soros' knickers reeeal good. Good deal. Not a surprise, but the size of the win matters. Maybe we will have a friend in Paris, which we have not had since the beginning of WW2. Right--54% of Frenchmen--that's "Frenchman" mind you--voting for the conservation of traditional western values, is huge. The jihad is in trouble now.